In Capital Marx writes that, like zombies, living labour under capitalism becomes 'subservient to and led by an alien will and an alien intelligence'. In tandem, the mass of machinery to which workers are subordinated in production assumes the form of an 'animated monster', a monstrosity endowed with a soul and intelligence of its own. Factories, machines, assembly-lines, computerised production systems all take on a life of their own, directing the movements of labour, controlling workers as if they were merely inorganic parts of a giant apparatus. As capital assumes the form of 'a mechanical monster whose body fills whole factories', workers become 'conscious organs of the automaton'. This reference to workers as organs of capital, which we also find in other Marxian texts, returns us to the theme of corporeal fragmentation. Labouring for capital, protests Marx, workers become mere appendages of this 'animated monster', dismembered body-parts activated by the motions of the grotesque corpus of capital. The logic Marx captures was captured brilliantly in the twentieth-century context by Harry Braverman. In Labor and Monopoly Capital, Braverman showed how a series of technical innovations enabled capital to increasingly control and regulate acts of labour as if they were indeed just interchangeable parts of a continuous flow of capital's self-expansion. Motion-and-time studies in particular, in which every process of production is broken down into a succession of smallest possible human motions, each of which is timed, have served as a means for employers to calibrate any and every work-process. Machines, equipment, desks, chairs, assembly-lines, price-scanning equipment and so on are all modified to decrease the time required to complete a motion. In a Guide to Office Clerical Time Standards, used by many corporations, almost every imaginable office-activity is subjected to time-standards. Opening and closing drawers, stapling, typing, opening envelopes are all so calibrated. Swivelling a chair in order to turn to another task should take 0.009 minutes, for instance. Abstract time, time measured and calibrated according to mathematical efficiencies, becomes the basis of concrete activity. As a result, humans become nothing but bearers of undifferentiated life-energies, dispensed in units of abstract time. In Marx's memorable phrase, 'Time is everything, man is nothing; he is at the most, time's carcase'.. What capital does to workers, therefore, is exactly what witches are said to do when they create a zombie: 'to reduce a person to body, to reduce behaviour to basic motor functions, to reduce social utility to raw labour', as one critic puts it. Perhaps now we can more fully grasp the poetic knowledge embedded in many zombie and vampire-tales, such as those emanating from Sub-Saharan Africa today. These fables dramatise some of the most fundamental features of capitalist modernity: its tendency to mortify living labour, to zombify workers in order to appropriate their life-energies in the interests of capital. If it is true, as Deleuze and Guattari write in Anti-Oedipus, that 'The only modern myth is the myth of zombies – mortified schizos, good for work,' then it is in Sub-Saharan Africa that this truth has been most powerfully rendered. And this is fitting. It was West Africans who, after all, captured as commodities in order to fuel the capitalist plantation-economy, most fully experienced the mortifying tendencies of capitalism. Indeed, Fanon's argument that the racialised and colonised suffer a kind of ontological death could be said to apply with greatest force to the experience of enslaved Africans. By reducing people – sentient, creative, passionate, loving, hating, desiring humans – to property, capitalist slavery imposed a death-in-life. Even after the abolition of slavery, anti-black racism continues to reproduce central aspects of this life-denying reification. As the urban poor of postcolonial Africa struggle today to understand the forces of capitalist globalisation that wreak havoc on their lives, they are drawing upon and reworking experiential categories derived from the ontological deaths of slavery, racism and colonialism. In so doing, they disclose essential truths about capitalism. As Marx observed, when we turn our gaze from the 'respectable forms' of capitalism in its heartlands to observe 'the colonies', the 'inherent barbarism of bourgeois civilization lies unveiled before our eyes'. Marx caught the capitalists of the British empire with bloody hands. . . . Marx had never forgotten the indigenous people of the Americas, or of Africa. Marx had recited the crimes of slaughter and slavery committed by the European colonials who had been sent by their capitalist slave masters to secure the raw materials of capitalism – human flesh and blood. In returning us to blood and flesh, witchcraft-tales from Sub-Saharan Africa and elsewhere disclose hidden truths about the capitalist mode of production. The most potent aspect of these tales is their rendering of zombies as forced labourers, workers compelled to produce for others. Not only do such tales capture the idea of alienated labour performed at the behest of others; equally significant, they also interrogate the invisibility of the process, its mysterious and elusive character, which enables it to escape sensory detection. In non-capitalist class-societies, such appropriation is entirely evident, with peasants and others directly handing over part of their labour, their product, or the money equivalent to the ruling class in the form of rent and taxes. But, in bourgeois society, it is capitalists who pay workers, offering them wages as payment for their labour. Yet, this visible exchange conceals the invisible counter-exchange from which capital profits. For, once they purchase labour-power as a commodity, capitalists can squeeze more from it than the value of the wages paid. They do so by obliging labourers to work longer than the time required to produce the value of their wages. Everything beyond this constitutes surplus-labour, to use Marx's terminology, a surplus-value above and beyond the capitalist's costs of production. As ever-expanding value, writes Marx, capital 'has acquired the occult ability to add value to itself'. But, as African vampire-tales intuit, this occult ability turns on monstrous exploitation of living labour, on capital's 'werewolf-like hunger for surplus labour'. Yet, because all of this happens in the darkness of the hidden abode of production – not in the noisy daylight-world where all other commodities are exchanged – it is unseen. No wonder, then, that Mary Shelley shows Frankenstein's Creature performing unseen labours at night to feed the De Laceys, or that African vampire-tales depict exploitation as a secret night-time ritual. To grasp the invisible powers of capitalist exploitation and accumulation requires the night-vision made possible by a dialectical optics.
. . . the exercise of labour-power, labour is the worker's own life-activity, the manifestation of his own life. And this life-activity he sells to another person in order to secure the necessary means of subsistence. Thus his life-activity is for him only a means to enable him to exist. He works in order to live. He does not even reckon labour as part of his life; it is rather a sacrifice of his life. It is a commodity which he has made over to another . . . life begins for him where this activity ceases, at table, in the public house, in bed. sells himself piecemeal. He sells at auction eight, ten, twelve, fifteen hours of his life, day after day, to the highest bidder . . . to the capitalist. The worker belongs neither to the owner nor to the land, but eight, ten, twelve, fifteen hours of his daily life belong to him who buys them. Wage-labour thus obliges workers to treat their creative, corporeal energies as divisible bits to be auctioned off. And this shapes and distorts the worker's sense of self. As Georg Lukács pointed out, commodification re-organises the very forms of human experience, the ways in which we perceive and understand ourselves and our capacities. Commodification both reshapes the world around us and penetrates into the psyche of the human individuals involved: 'Objectively a world of objects and relations between things springs into being (a world of commodities and their movements on the market). Subjectively – where the market-economy has been fully developed – a man's activity becomes estranged from himself'. Labour-commodification thereby 'stamps its imprint upon the whole consciousness of man; his qualities and abilities are no longer an organic part of his personality, they are things which he can "own" or "dispose of" like the various objects of the external world'. The commodification of labour-power, the transformation of human creative energies into commodities, thus daily realises 'the absurd tale of Menenius Agrippa' in which human beings relate to their life-energies as alienable fragments of personhood, as dead things that can be sold off. The secret of capitalism resides in this fragmentation of the labouring self, in the way that wage-labourers turn over their bodies of value to capital in incremental bits over a lifetime. The time workers give over to capital is 'dead time', time separate from their 'real' lives, a sort of death-in-life. No wonder, then, that images of the living dead proliferate so widely in the capitalist culture-industry. And no wonder too that workers newly subjected to the pressures of commodification find this death-in-life anything but normal. Typically, they encounter it as positively demonic – an unnatural and depraved theft of their life-energies. In Britain, before workers became habituated to looking upon the requirements of capitalism 'as self-evident natural laws', the horror of fragmented personhood was registered in riots against the anatomists. 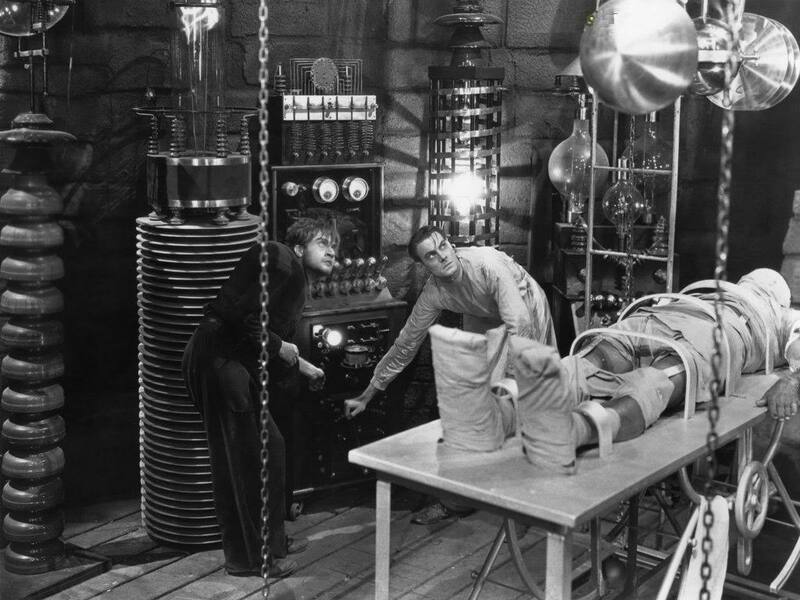 And Frankenstein gave literary expression to these plebeian anxieties about the processes of dissection and dismemberment central to the rise of capitalism. Order Monsters of the Market for 50% OFF!